Okay, let’s hold on to summer for a few more days, shall we? Check out these gorgeous hibiscus flower decals! I love hibiscus flowers, I have a big red hibiscus bush/tree/shrub/whatever they are on my balcony and I’ve owned it for years. It is getting a little bit cold for it outside now, but it will have to make due for a few more days. 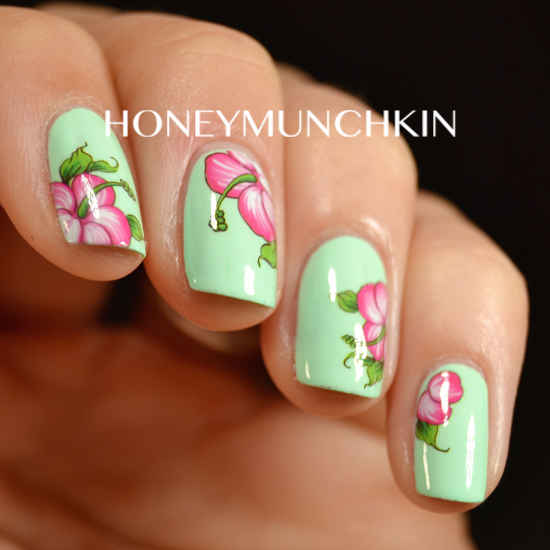 I’m wearing these decals on China Glaze – Highlight of my Summer from the Sunsational collection. These decals are a bit on the large side, and a bit sturdier than some of the decals I’ve previously worked with because of how they are printed (colored ink on a white base). All that really means is that it takes a little bit longer to apply them, and a bit more massaging them into place. As you might have noticed, I messed up the middle finger decal a bit during application, but heck – I’m only human! I love this color combination, and it was only after I had taken these photos that I saw that someone had already beaten me to it. Nailingtons posted a similar manicure in her review of these decals, but she zazzed it up with some glorious stamping, so be sure you check her post out as well! Sorry, Sophie, for the unintentional plagiarism! In her post she mentions using warm water instead of cold to make the decals more manageable, which I will now definitely try next time. You can purchase these decals at BornPrettyStore.com for $2.86, and if you use my promotion code below, you’ll get 10% off! Hey! Nice review :) thank you for the link.. and no plagiarism at all^^ its a great colour combination and a natural choice to really make those decals stand out. I think no matter what happens in the world of nail art, there is a similar idea somewhere. Your photos are beautiful by the way. I have the same waterdecals also sent out for review and I have to say that I love how they look over that mintgreen.